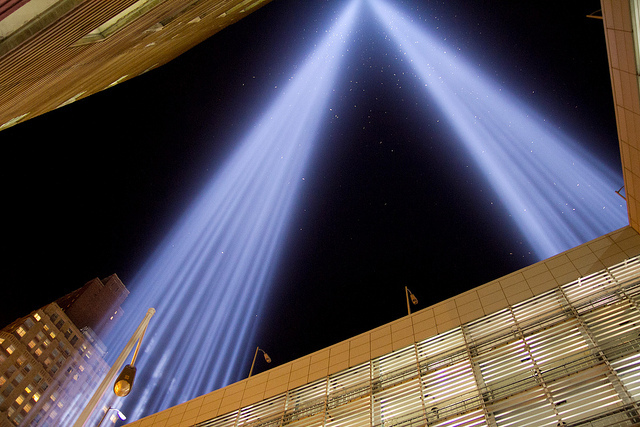 From dusk tonight until dawn tomorrow morning, eighty-eight 7,000-watt xenon light bulbs positioned into two 48-foot squares will echo the shape and orientation of the Twin Towers. This ” Tribute in Light” reaches 4 miles into the sky and is the strongest shaft of light ever projected from earth into the night sky. On a clear night it is visible for 60 miles in every direction. These spectacular beams draw our eyes, but they also draw birds. By the thousands. Migratory birds that would normally just be passing through are attracted to the beams like moths to a flame. And to observers on the ground, it must seem like something of a miracle, these swirling , sparkling, and calling creatures, lit from below as though being lifted by the light. Click the photo above to enlarge it and you can see the birds. But then the reality of the situation becomes apparent. The birds are trapped there — unable to see their way out or tear themselves away from the columns. As well, they are quickly using up precious energy needed to complete their migrations. Fortunately, the Municipal Arts Society, the organization that runs the Tribute in Light, was concerned about the birds. Following the first lighting in 2002, they immediately engaged the help of New York Audubon volunteers who now monitor the beams every year. When too many birds become stuck, the lights are turned off for 20 or 30 minutes to allow the birds to leave. The number of birds varies from year to year depending on wind, weather, the moon phase and other factors. In 2012, Cornell ornithologist, Andrew Farnsworth recorded his observations at the Tribute in Light on eBird. In two hours, he and his team recorded more than 2000 birds covering 28 species plus 7 other taxa. I find it encouraging, that while we remember the greater importance of the human lives lost in 9/11, we have also acknowledged the importance of the smaller creatures with whom we share our cities and lives.